It is almost a hundred years since Grandpa was born in the family home on the bank of the Assiniboine River approximately where Maryland Bridge, in Winnipeg, was built many years later. 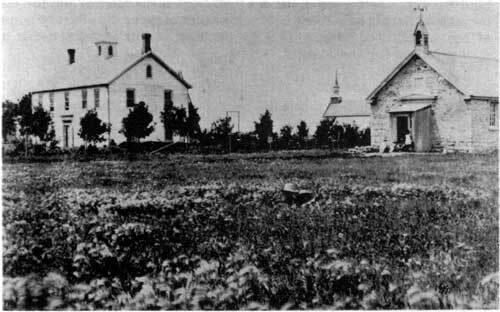 The nearest school was away out on the Portage Trail near the St. James's church and cemetery. Before Grandpa was old enough to go to it, his father and mother moved back to Kildonan, and when he was quite a little boy he went to a school kept in their own house in Kildonan by two Miss Dahls. He did not think they taught him very much, perhaps only to sing the alphabet and to make his letters, or maybe to learn a psalm by heart, but he learned to sit still among other children and he liked his teachers. There were no kindergartens then. His first real school was the one at "Frog Plain" in West Kildonan, the very stone building that is now called Nisbet Hall, near the old Kildonan Church. There was only one teacher, Mr. Whimster, and he was very strict, as he needed to be, because he had a hundred and twenty pupils, little boys and girls and big boys and girls, and even grown-up young men with whiskers who were preparing to go to college in Toronto. Some of the pupils had to walk a long distance to school, and those on the east side of the river crossed on the ice in the winter and paddled their dug-outs in the summer. Sometimes there were boys in the school who had been sent in from far-off trading posts to live with friends or relatives in the Settlement so that they might go to school. Grandpa liked to tell about two of these who arrived from the North in the early Winter without socks or duffles in their moccasins. The Kildonan boys considered themselves pretty tough, but they had to take off their bonnets to Cubby Mackay and his brother. Most of the work was done on slates; paper was very precious when there was only one boat a year to Hudson Bay with supplies for the settlement, and it was used only for pen and ink work by the older pupils. Often in the winter the ink would be frozen overnight, for the school was heated only by stoves and the wood fires did not last long. The way Grandpa used to tell it, even little boys had lessons that nowadays we should not expect until Junior High, and he always said it was because Mr. Whimster made them learn Latin roots that he was so good a speller. Grandpa's eyes would twinkle as he told one story: "It was not until Whiskey Jack started his brewery near the school that there was any yeast in the Settlement, " he would explain, "before that our mothers made only bannock, not raised bread. " (The grandchildren thought that bannock was much nicer than bread!) "But after the brewery was built we would carry bottles to school with us and at recess go over to have them filled with the soft yeast, barm, we called it then. One very cold winter day I was afraid to leave my bottle in the porch lest it should freeze, so I took it to my seat, which was near' the stove, and set it on the floor where it would be warm. It was warm right enough, and in the middle of the after-noon there was a bang that raised me right out of my seat, the cork hit the ceiling, and yeast foamed all over the place. No, Mr. Whimster didn't strap me, though I thought he might. He just laughed after everything was cleaned up, and went on with his class. Maybe he thought it was good elementary chemistry!" Kildonan Presbyterian Church, Manse, and Nisbet Hall one of the Red River Settlement's schools.